Barakamon follows handsome young calligrapher Seishuu Handa as he moves to a small Japanese island after a falling out with the calligraphy community. However, Handa finds that rural life is not quite what it seems as he adjusts to his quirky but kindhearted new neighbors. Soon known as “Sensei” throughout the town, Handa quickly finds himself beginning to change as he learns to adapt to his new setting. It’s been a little while since Handa moved in, and he’s begun settling into the rural life. Although he moved for some peace and quiet, he has found very little of that as his house has become the location for many of the local kids to hang out, and they all seem to enjoy his company quite a bit. The longer he lives here, however, the less Handa finds this to be a bad thing. Barakamon is not very focused on a central story, and while the first volume might leave readers wondering about the direction, the second volume clears this up slightly by indicating that the primary focus of the story is not so much about the plot as it is about the daily life of Handa. However, a more central story line is hinted at towards the very end of the volume, and while not overly cliff-hanger-y, it did intrigue me about what would happen next. The lack of a central story works very well with Barakmon’s general structure, which is more or less an episodic frame. Honestly, it would be more than plausible to read the chapters in the volume out of order, as they don’t necessarily tie in to each other and instead when read together merely strengthen the development of the characters as a whole. I found this to most definitely be an appealing style as it reflects the kind of daily life Handa lives on the islands. On the subject of characters, Handa’s progressive acceptance of his setting continues to be a primary focus, and different aspects of this are highlighted in each chapter as he interacts with different villagers in different ways. There’s also a sort of relaxing element that the ‘episodes’ manage to capture quite well, because by letting the readers see the different parts of the town, the story drew me into the setting very effectively and thus allowed me to connect with the characters on a different level. This is aided by the translation, which was handled very well by Yen Press in this volume. The Gotou islands of Japan, which are where the setting of Barakamon is based on, are much more authentically captured for Western audiences by translating the Gotou dialect of Japanese into a rural Southern dialect of American English. Additionally, the translation notes help immensely to understand the translator’s choices as well as highlight certain cultural aspects that might have otherwise been lost on me. There really isn’t a whole lot to complain about at this stage in the game if you are a slice-of-life fan. The overarching story still hasn’t quite started, but shows signs of beginning in the next volume, so it shouldn’t be too much of a concern. At its heart, Barakamon is a relatively slow paced, country-living oriented book, and anyone who has read the first volume already should know what to expect for this one. 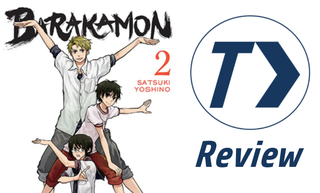 Barakamon is a very well thought-out slice-of-life, and the 2nd volume continues to impress us. The style of storytelling ties in very well with the setting, and the translation was very well thought out. If you’re looking for a more relaxing story that will generate some laughs and emotions, then I would highly recommend the second volume, especially if you enjoyed the first volume of the series. Barakamon Vol. 2 was authored by Satsuki Yoshino and published by Yen Press on December 16, 2014. Barakamon is an ongoing series in Square Enix’s Gangan Online magazine, and received a single-cour anime adaption by Kinema Citrus in Summer 2014. Volumes 3 and 4 are currently available in English and volume 5 will release in North America on June 23rd.